Before applying, you will need to first cleanse and tone the skin. 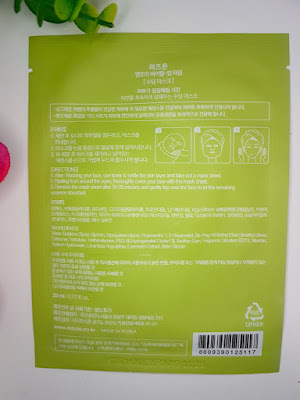 Next, you need to remove the mask from the sachet and fit it onto your face. It is one of those masks that don’t have little tabs to pull it open so do take care not to accidentally tear it as you unfold it. Leave the mask on for 10-20 minutes, remove, and then let the remaining essence absorb into the skin (massage or pat into the skin if you need to). In regards to fitting on your face, I think that the cut outs for the eye area could be a little bigger, but if you need them bigger then you could always cut them a tad. That may be messy with the essence on the mask though. Otherwise, everything else fits quite snug, but admittedly this can vary from person to person with different face shapes and sizes. There is quite a lot of essence on the mask, so you will need to be quick to prevent it from dripping everywhere. It has a lovely scent of fresh lavender, so it makes it a perfect bedtime treat to help you relax. When on the face, the Enjoy Vital-Up Time Soothing Mask doesn't have a tendency to slip off like some sheet masks, but I will also add that I don't tend to move too much whilst wearing a sheet mask so I can't vouch for that if you like to walk around whilst wearing it. Once removed, it leaves a lot of essence behind and it takes a while to absorb even with help patting or massaging it into the skin. With that said, once it has absorbed, it does leave the skin feeling super hydrated and calm with no irritation. The dry areas around my nose from the virus I’ve had over the last couple of weeks also felt far less sore and dry. As well as having skin that is prone to sensitivity and occasional dryness in certain areas, my skin is oily and blemish prone. This mask didn't make my skin any more oily and also didn't cause any blemishes. Instead, it actually helped to reduce any redness from the sensitive, dry and post-blemish marked areas. 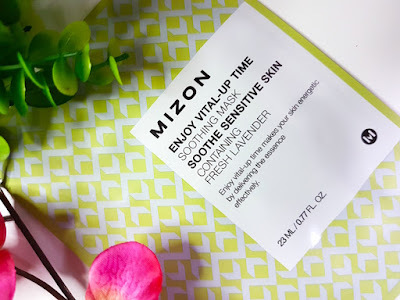 For the price, I think that this Mizon face mask is amazing value for money. There are masks out there that cost far more and don’t work as well as this does. This is the type of mask that is great to stockpile for those days when you come home and just need to relax, refresh and hit that reset button. I’d say that this is the type of mask that is perfect to use at the end of the day, before sleeping. The lavender helps to relax you and to get you ready to sleep, but then with the fact that it takes some time to absorb it is better suited to when you’re not in a rush and do have the time to kick back and relax. If a soothing essence isn’t your type of mask, KlipShop also have a range of others available such as Lift Up, Tone Up, Anti-Wrinkle, Nourishing, Firming and Watery Moisture, all at a great price. Because they are available as single sachets, you can effectively create your own pack of face masks ready to go for whenever you need them. 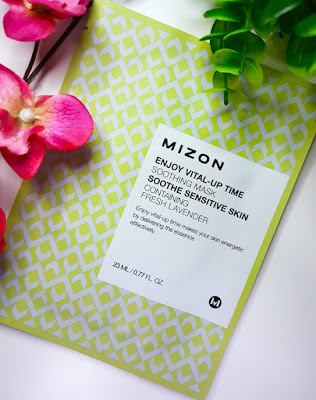 You can buy the Mizon Enjoy Vital-Up Time Soothing Mask from KlipShop. 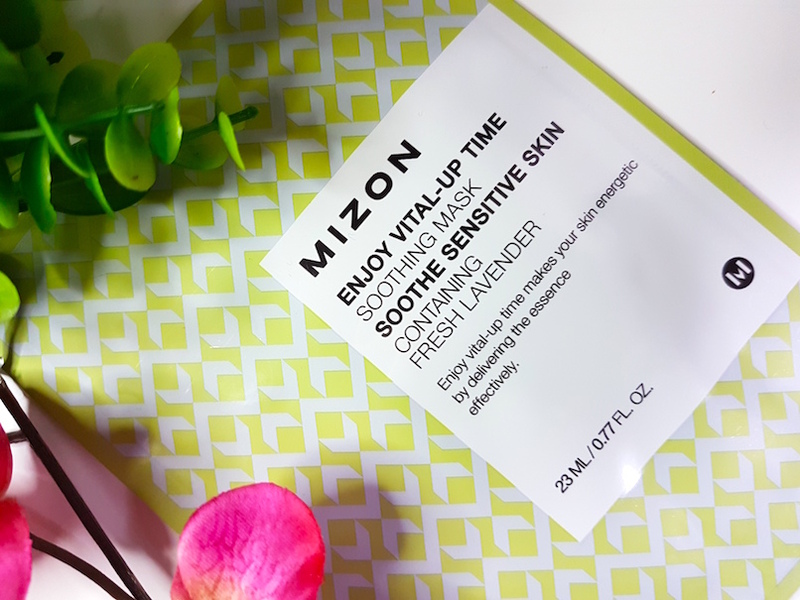 What are your thoughts on the Mizon Enjoy Vital-Up Time Soothing Mask? What are your favourite face masks?